Here are some simple tips to help identify, or determine the age of, a genuine antique. 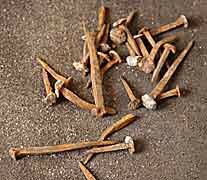 Old nails were handmade, square and often had beaten heads and were generally uneven in appearance; whilst modern nails (post circa 1880) are mass produced and uniform. Look for a blackened area of wood around corroded iron nails. The Cabinet Makers tools always leave clear clues as to the period when the furniture was made. For example, modern planes and Period planes work differently and leave completely different scars, likewise Period saw-marks are unevenly parallel compared to modern saw-marks which are identically parallel or radial. Early glue was made from animal products ( including hide, bones and fish) melted in a glue kettle and mixed with water. Over time the glue dries and crystallizes. Importantly this glue is reversible and therefore antique 'friendly', as opposed to modern PVC glue which is neither. So look for signs of crystallized glue, also loose joints can indicate that reversible glue was originally used. Always look for worn components in the right places, take your time to check the piece carefully and look for signs of use on the base of the feet, drawer runners, chair rail stretchers and any area of potential wear. More information on antiques including restoration and conservation can be found here.